With a gorgeous faded floral motif and contrast sleeves, this royal blue Marina Rinaldi tunic is an elegant statement piece. 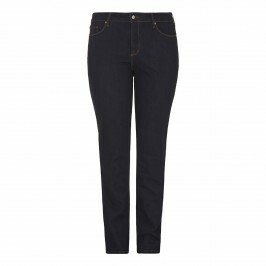 Team with your favourite indigo jeans for a polished daytime outfit. Navy print crepe front tunic with jersey back and sleeves. Jersey: 94% Viscose, 6% Elastodiene. Crepe: 100% Polyester. Delicate Machine Wash.